Technology is being developed to allow people with severe motor disabilities to play 3D computer games like World of Warcraft using only their eyes. Since the 1990s, gaze technology - or eye tracking - has helped people with conditions such as motor neurone disease (MND), cerebral palsy and other ;locked-in syndromes' to control 2D desktop environments and communicate using visual keyboards. Users typically guide a cursor with their eyes, staring at objects for a time to emulate a mouse click. But that is too laborious to let users to match the speed and accuracy of real-time 3D games, say researchers on the project at University, Leicester, UK. The team are developing the software as part of the EU-funded project Communication by Gaze Interaction (COGAIN). Even though a user in, say, Second Life might look as if they are able-bodied, if they can't operate and communicate as fast as everyone else, they could be perceived as having a disability, hence privacy issues for players who may prefer not to reveal their disability in the virtual world. In virtual worlds, gamers need to perform a whole suite of commands including moving their character or avatar, altering their viewpoint on the scene, manipulating objects and communicating with other players. Eye-gaze systems bounce infrared light from LEDs at the bottom of a computer monitor and track a person's eye movements using stereo infrared cameras. This setup can calculate where on a screen the user is looking with an accuracy of about 5 mm. A ‘gaze gesture’ is also built in to temporarily turn off the eye-gaze functions altogether, to avoid unintentionally selecting an item while looking around the screen. Clearly our eyes are perceptual organs, not designed for pointing and selecting. You can't turn them off, like you can lift your hand off the mouse." Enabling someone to express themselves and engage with people in ways that they can't do in real life - because they are restricted to a wheelchair or a bed - can have a really positive effect on their self-esteem and motivation. Trials of the software with people with locked-in syndrome are proving well. One exciting example is the research going on at the Photonics and Sensors Group at the University of Cambridge. Developing breakthrough holographic technologies, which will power a new generation of pocket-sized holographic projectors. Holographic projections are in fact surprisingly simple, requiring only a few components, which means they can be made very small. In the near future, holo-projectors will be integrated into laptops, PDAs, even mobile phones. So why has this not been done before? (1) Holograms are extremely complex objects mathematically, and calculating them fast enough for video applications is very difficult; even the most powerful computers of - in real-time - the past would take minutes to calculate, generate and project even very a simple holographic video frame. (2) The projected images produced by early holographic technology tended to be speckled and of very low definition quality. (3) The lasers that are required to illuminate the holograms have, until very recently, been very expensive and limited in availability. But this is now history. Several major breakthroughs have been made, together making possible the generation and display of high quality holograms at video frame rates, using just a single custom chip. A hologram pattern, which to the eye looks like a collection of random dots, is displayed on a small liquid-crystal-on-silicon (LCOS) microdisplay - a tiny, very fast liquid crystal display built on top of a chip. The hologram patterns are calculated by a custom ‘holo-chip’ so that when the microdisplay is illuminated by laser light, the light interferes with itself in a complex manner through the physical process of diffraction, which when carefully controlled, results in the formation of a large, high quality projected image on, for example, a screen or a wall. Click here, you'll be amazed! Telstra - the Ozzy Multimedia Corp - used the Musion Eyeliner System to beam a live holographic image of senior staff member, between Melbourne and Adelaide, in what has been billed as world first. Telstra’s chief technology officer Dr Hugh Bradlow, based in Melbourne, appeared at a business function in Adelaide as a real-time holographic effect and interacted with members of the audience for around 15 minutes. 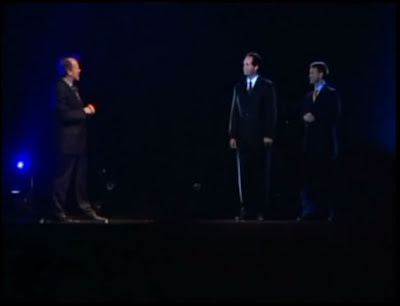 The real time hologram of Dr Bradlow was made possible by the company's high-speed networks and the Musion Eyeliner holographic projection system. We've all seen this sort of thing in sci-fi , but the reality is here, now and demonstrated. (Click on title for Holo Vid). Click on title to see Holographic of KM. Rapid Emergence of Holographic Technology and Applications. From product design to architecture to entertainment to communications to education holographic kit is about to rear its head and smash more technological paradigms per unit time than any other. Along time in the pipeline, 'High Definition Holographic Projectiors' (HDHP) that are at a marketable price point, practical weight and size, and acceptable reliability are now hitting the market. There are well over 100 R&D programmes, with dozens of companies launching commercial, and soon consumer HDHP systems. Not to mansion the multiple service providers ranging from marketing communications to entertainment to design. A video (click on above title) shows the system being used to place the first public voiceless phone call on stage at a recent conference held by microchip manufacturer Texas Instruments. Michael Callahan, co-founder of Ambient Corporation, which developed the neckband, demonstrates the device, called the Audeo. Users needn't worry about that the system voicing their inner thoughts though. Callahan says producing signals for the Audeo to decipher requires "a level above thinking". Users must think specifically about voicing words for them to be picked up by the equipment. The system demonstrated at the TI conference can recognise only a limited set of about 150 words and phrases, similar to the early days of speech recognition software. Augmented Reality is a specialization of computer vision that attempts to extract the 3D structure of a scene from video and then insert with high precision virtual or 3D objects into the scene. AR can be useful in many applications including entertainment, heads-up displays, tourism and surgical visualization. Consider for example visiting a foreign country and not having a map. If you want directions to your hotel from any location in the city then you can just take a photo with your cell phone camera and using the phone’s build-in AR software determine your location; the AR software would then retrieve directions wirelessly from a large database and present them to you by annotating the original photo. Another application would be retrieving information about a historical monument that you are looking at. An example of AR is shown in the following video from related research at the University of British Columbia. Researchers from The University of Tokyo Shinoda lab have figured out a way to add touch to holograms. Hyperphones with nanoscale engineering capabilities are in the R&D labs NOW. Click on title to a product concept video presenation from Nokia Nanotech. Mind blowing stuff. Capable of things we now do not only have, but have not even have thought of before. Head Tracking for Desktop VR Displays using the Wii Remote. Using an infrared camera in the Wii remote and a head mounted sensor bar (two IR LEDs), you can accurately track the location of your head and render view dependent images on the screen. This effectively transforms your display into a portal to a virtual environment. The display properly reacts to head and body movement as if it were a real window creating a realistic illusion of depth and space. You may need the most recent version of DirectX installed for this to work the Software to run the DesktopVR program.